This couple's wedding ceremony and reception were held at Compass Point Events in Algiers, which is on the west bank of the Mississippi River directly across from the New Orleans French Quarter. This is a unique and quaint venue, featuring an assortment of authentic creole cottages of various sizes around an outdoor space. Compass Point also features wonderful in-house catering, and floral arranging. Flawless Bride did the hair and makeup, and the expert ladies from Down Annie Lane were on hand for decorations and to help with day-of coordination. 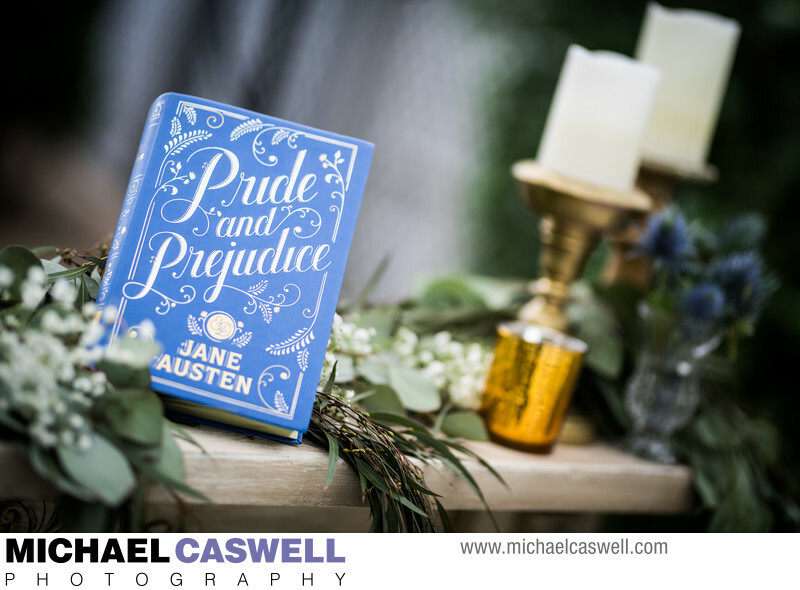 On display on a beautifully decorated mantle was a copy of Jane Austen's Pride and Prejudice, one of the bride's favorite books. This was actually used when the groom proposed, as he had painstakingly hollowed out the inside of the book (in the shape of a heart) and hid the engagement ring inside. As the start time of the ceremony neared, a light but persistent drizzle began to fall, but the couple decided to stick it out and proceed with their planned outdoor ceremony (with a lot of umbrellas! ), which was officiated by the bride's father. 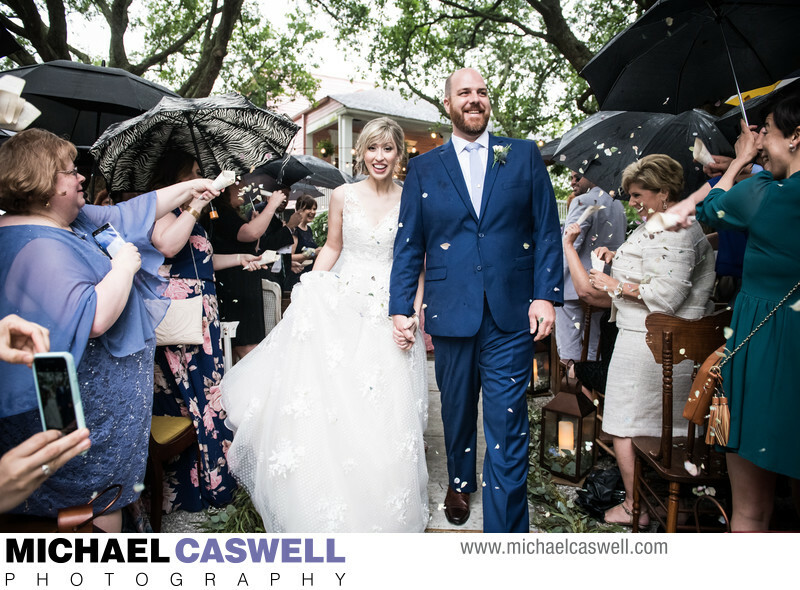 The groom, the perfect gentleman, held the umbrella over his beautiful bride, until they reached the point of the vows and ring exchange, at which time the bride's sister-in-law and the groom's brother sprang into action to hold the umbrellas for them. Then at the conclusion of the ceremony, guests tossed flower petals as the newly married couple made their way down the aisle. The best part about all this was that although I'm sure the bride wasn't particularly thrilled about the rain, you would not have been able to tell, as her happy and cheerful demeanor was not diminished in the least. The reception was moved inside, where DJ Rex was on hand for the entertainment. La Louisiane Bakery provided the wedding cake, cupcakes, and groom's cake, which featured a subtle (but unmistakable, for fans of the movie series) Star Wars theme. 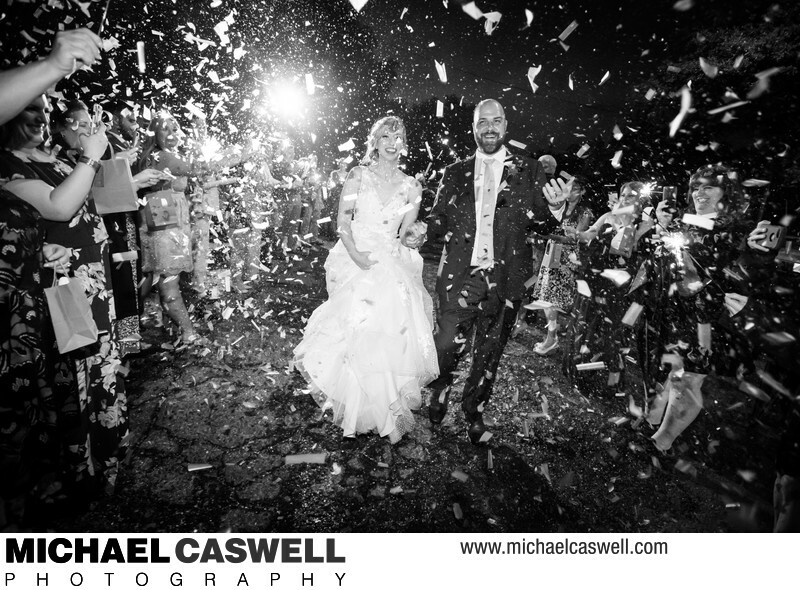 The weather had cleared by the end of the night, so the guests were able to give the couple a spectacular confetti-cannon send-off! Location: 200 Opelousas Ave, New Orleans, LA 70114.